Ah! 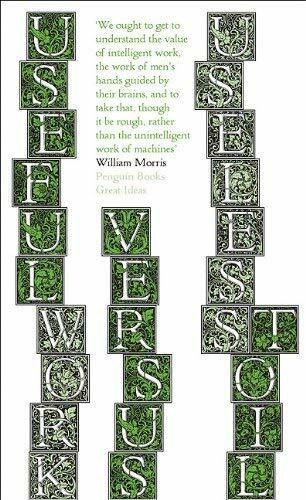 Useful Work versus Useless Toil by William Morris. We must have mentioned this essay here before, no? I decided to read a few lines from this sacred text this afternoon and found myself hooked and reading on and on. I even wondered idly if I shouldn’t self-publish a gorgeously typeset annotated edition with my own comments and research and jokes in the margins. Yes, I shall whack it on the “Someday Maybe” list. Expect it in a decade or so. The above title may strike some of my readers as strange. It is assumed by most people nowadays that all work is useful, and by most well-to-do people that all work is desirable. Most people, well-to-do or not, believe that, even when a man is doing work which appears to be useless, he is earning his livelihood by it – he is “employed,” as the phrase goes; and most of those who are well-to-do cheer on the happy worker with congratulations and praises, if he is only “industrious” enough and deprives himself of all pleasure and holidays in the sacred cause of labour. In short, it has become an article of the creed of modern morality that all labour is good in itself – a convenient belief to those who live on the labour of others. But as to those on whom they live, I recommend them not to take it on trust, but to look into the matter a little deeper. Straight to the point and with such lovely, lovely, snark. If you, like I, are sucked in by that, you can read the whole essay online, get it from your local library, or buy the pretty Penguin edition. Sorry about Morris’ constant use of “man” and “men” to mean “people” or “humanity”.